Moisturizing replenishing after sun shampoo. Davines Hair Care created this moisture rich blend to replenish hair that has been exposed to the sun, salt water and chorine. It delicately cleanses and detangles, leaving hair soft and manageable. Davines added Sweet Almond Proteins for its protective and exceptionally moisturizing effect, especially in synergy with an Olive Oil derivative. Hairsphere, a system of fatty acids, provides long lasting hydration by attaching to hair. Recommendation: Gently massaging on wet hair exposed to sun, sea salt and chlorine. 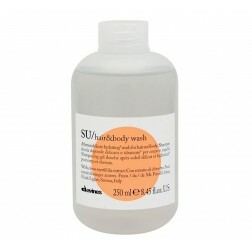 Follow with SU Leave in Conditioner or Su Mask Pak.